is the first mint you will think of when it comes to mint plants for sale. Peppermint Mint is used most widely in recipes and blends best with dark chocolate. Visit the Huffington Post site for a selection of recipes to use mint leaves. Remember to plant mint plants in containers or other contained area of your yard. During the growing season, clip off the oldest growth to encourage new plant growth. In the fall, cut the mint plant back to the ground. The Blue Balsam Peppermint Plant matures in the 1 to 2 foot height range with a spread of up to 2 feet. In the late spring to early summer months, peppermint blooms with violet to lavender flowers attracting bees and butterflies. 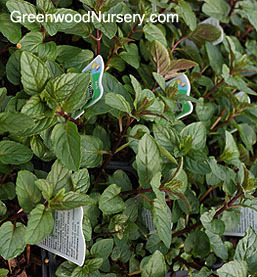 Blue Balsam Peppermint Mint ships in 3.5 inch pots.